Check the contents of the shipment and compare them to the shipping package list. Check for any missing or damaged components. Some parts/sub-assemblies may be shipped inside the gutter machine, and must be removed prior to any operation. Keep both the gutter machine and the surrounding work area clean and free of dust, dirt and debris. Routine cleaning of the entire gutter machine will help extend the life of all mechanical and electrical components of the gutter machine. In particular, a clean gutter machine and work area will help prevent the presence of foreign objects into the gutter machine, which can most likely damage mechanical components. READ ALL MOUNTING INSTRUCTIONS, SPECIFIC TO YOUR BRAND OF GUTTER MACHINE, PRIOR TO MOUNTING THE GUTTER MACHINE. The gutter machine should be permanently mounted where it will be used (in the bed of a pickup or panel truck, on a trailer, on a special bench). 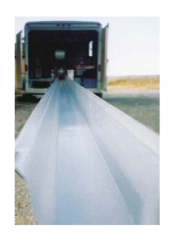 During transport/moving, the gutter machine will experience vibrations/shock normally associated with vehicular or trailer transport. Without the correct preparation, this vibration and shock can severely damage the gutter roll forming machine with a steel rolled drive train. Entry end - the end of the gutter machine into which the material is fed, the end with the black curved guides; also called the front end or feed end. Exit end - the end of the gutter machine from which the finished gutter profile emerges, the end with the shear; also called the rear end or discharge end. The Standard Control package includes a red drum switch (motor control) located on the exit end plate on the right side, and an E-Stop switch located on the right side near the entry end. Buying a seamless gutter machine is the biggest investment most installers will make in launching or expanding a gutter business. Should you buy a gutter machine to make 5" or 6" gutters, or one that makes both? If prices for gutter machines are comparable across the industry, how do you choose between one manufacturer and another? Are used gutter machines a viable alternative? When does it pay for an installer to add a gutter machine for making half round gutters or other specialty high-end products? To find some answers, Gutter Opportunities spoke to some of the nation’s leading gutter machines manufacturers to hear their advice for installers, as well as learn what considerations they face in bringing their gutter machines to market. There are several different types of seamless k-style gutter machines: 5", 6", 5"/6" combination gutter machines, 5 1/2" fascia gutter machines, and gutter machines with the Alcoa-style hook. Affordable gutter machines to make seamless half-round gutters have yet to hit the market; current models cost approximately $40,000 and are not portable. 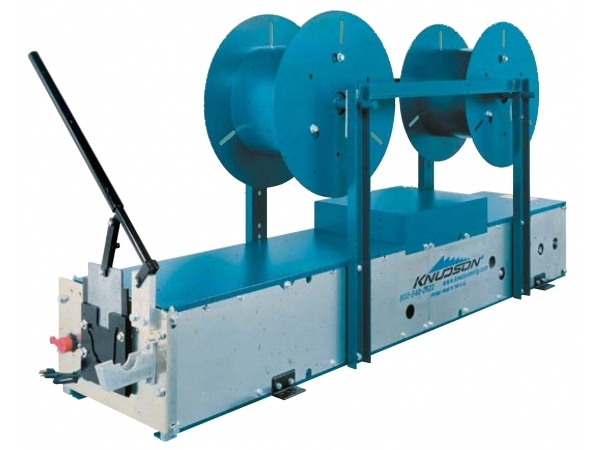 Pricing for a new K-style seamless gutter machines can range from $5,875 to $15,000 depending on the size and brand. When buying a gutter machine most people ask what the major difference is between the types of gutter machines. The main difference is the drive roll system, whether it is a polyurethane drive roll system or a steel roll system. Polyurethane drive roll systems are considered the top of the line for the following reasons: First, they are free-floating; with no need to travel from jobsite to jobsite with coil in the gutter machine, there is less material waste. Second, they enable the gutter machine to run 24-gauge steel. Third, polyurethane rollers grab the coil better, which means less slippage in cold weather and condensation. In addition, because gutter machines with polyurethane drive trains are top of the line, they come with other bells and whistles that others do not, such as: turnstile uprights that rotate 360 degrees; push-button controls at entry and exit ends; and jog- and continuous-run switches. With steel roll system gutter machines you need to travel from jobsite to jobsite with coil run through the gutter machine to prevent the gutter machines from falling out of adjustment. Nor, will these gutter machines run 24-gauge steel. 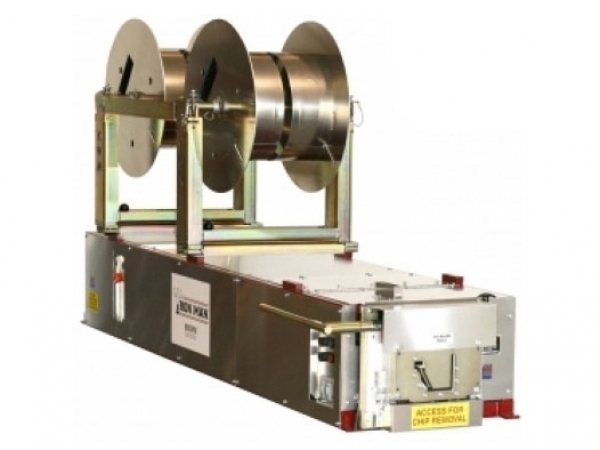 Both types of gutter machine, steel and polyurethane drive, will run aluminum and copper. Additional questions to consider when buying a gutter machine include: What size gutter does your market call for, 5" or 6" or both? If 5", you need to know the size of coil is 11 7/8" or 11 3/4". The gauge for all sizes is .032 or .027. What material will you be running through your gutter machine? Determines the thickness of the metal that you are feeding into the gutter machine. Most common material used is aluminum, and copper. What is your time frame? Typical lead times for delivery of a gutter machines is anywhere from 10 days to four weeks depending on the brand and model. Where is the gutter machines going to be stationed? Will it be in a shop, on a truck, or in a trailer? Run-out stands that hold the gutter as it rolls out of the gutter machine and prevent a downward slope in your gutter. Machine-mounted cradles that go in place of an upright for easier loading and unloading of coils onto your gutter machine. Floor cradles that are great time-savers for smaller runs of gutters since you do not have to load a spool of a small coil for just a small footage. You place your coil in the cradle behind the gutter machine and run it through. Should you buy a new or used gutter machine? Although gutter machines have changed slightly over the years, the gutter has remained the same. If you are looking for a bargain and the gutter machine appears to have been taken care of over the years, you can find a good deal on a used gutter machine. A used gutter machine will tend to fall out of alignment more frequently than a new gutter machine, so you should be very familiar with any used gutter machine you buy. If you are familiar with a gutter machine and able to adjust them, a used gutter machine is a good deal. Otherwise, the time and money to find someone who can periodically adjust a used gutter machines will quickly offset your savings. Buying a new gutter machines gives you time to become familiar with the gutter machines before something happens. With a used gutter machine, you never really know what you are getting. Mike Milliman is co-owner of RainTrade Corporation, a gutter supply company based in Lake Bluff, Ill., and distributor for three gutter machines manufacturers. Pacific Rollformer’s gutter machines employ a “direct-drive” system in a design the company created in 1959. Other manufacturers use “gapand-camber” drives, Pengra says, or “rubberdrive” systems that have been introduced over the past decade. “The drive system with the least contact gives you the best product,” he advises. According to Pengra, there are perhaps “six or seven major manufacturers” of gutter machines in the United States. Though Pacific’s machines have twice the weight of other models, he continues, “We market our products as ‘the only gutter machine you’ll every buy.’” While competing gutter machines have an industry-average service life of seven to 10 years, he contends, Pacific machines last an average of 17 to 22 years and run an average of seven to nine years between service calls. The future development of gutter machine technology presents a yes-and-no scenario, Pengra believes. “On the one hand, with the growth of metal roofing we’re getting technological advances that could be applied to gutters,” he suggests. “Also, metal roof panels have started to be architectural pieces. Gutters haven’t even begun to realize themselves architecturally; they’re just a design afterthought. Ogee-style gutters are based on old Victorian woodcarving patterns. Maybe someday, somebody will get innovative with gutter designs — and then we’ll need the gutter machines to make them. 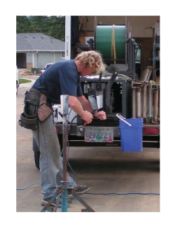 Whether an installer buys a 5" gutter machine or 6" gutter machine “will depend on the territory you’re in and the types of gutters sold there,” advises Jerry Jacobs, marketing manager for Jobsite Inc., a manufacturer of gutter machines based in Grand Junction, Colo. Sales manager Andrew Wilke shares that opinion. “In the North and Northeast you see a lot of 6" gutter,” he reports. “In the South, Southeast, and Midwest a 5" k style gutter is common. In California, half-round gutters are becoming popular with many homeowners. In Northern California, Oregon, and Washington, people like fascia-style gutters. Jacobs and Wilke also put the number of major U.S. gutter machine manufacturers at about half a dozen. “You want to buy from a manufacturer who’s been around a long time, especially in your territory,” Jacobs recommends. 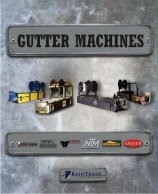 By contrast, he says that some companies have moved their manufacturing or parts operations offshore.Other key points to consider in looking at various models of gutter machines, he adds, “are the warranty, the drive system, the motor horsepower, and the type of roller - such as urethane-based versus hard chrome steel. How long a gutter machine will last, or how long it will go between service calls, “is determined more by the operator than by the manufacturer,”suggests Jobsite service manager Bill Davis. “Service needs mainly crop up as a result of having to switch the gutter machine to run different kinds of metals,” he explains. “In some areas of the country you have to offer a variety of metals to satisfy your customers. So you’re probably going to need service on your gutter machine. But as a rule, you should be able to go about five years between service calls, if you take good care of your equipment. In addition to the key considerations cited by Jacobs, Davis says another vital factor for evaluating a gutter machine is “the bracing that’s inside the gutter machine and the material used for the bracing.” Over time, vibration can take its toll. Well-designed bracing, made of angle iron rather than simple flat-bar steel, can help. Davis concurs that prices for gutter machines are fairly uniform throughout the industry. Jobsite’s models start at $6,500 for a 5" gutter machine and rise to between $14,000 and $15,000 for combination gutter machines that can run both 5" and 6" gutters. “But there are two things to keep in mind with a combination gutter machine,”warns Davis. “It can take a long time to change over from 5-inch to 6-inch operation, and you need maintenance people to do it. Most gutter companies can’t do it alone. And every time you change Gutter Machine the gutter machine it affects the settings. So after a year or so, the gutter machine will need adjusting. A used gutter machine can save gutter companies money on the initial purchase price. But installers who go that route, Davis cautions, “should first run some coil through the gutter machine, and then take a hard look at the quality of gutter that comes out. Looking to the future, Davis expects to see a trend toward larger gutters - and larger gutter machines. “The industry is already seeing 7-, 8- and 9-inch gutters,” he observes, “and so I think as more of the larger gutters are sold, the gutter machines to produce them will become more available. Given the competition among gutter machine manufacturers, “nobody who’s still around puts out a poor piece of equipment; otherwise, they wouldn’t still be in business,” contends Fritz Batz of Knudson Manufacturing, Broomfield, Colo. “So if it’s true that all the gutter machines on the market produce a hangable gutter, the difference among manufacturers becomes the level of service and support. Even price is not much of a differentiator among gutter machine manufacturers, Batz continues, “since all the manufacturers are fairly close on their prices.” Knudson’s strategy is not to market itself as the low-price leader but rather, he explains, “My goal is to have our gutter machines run 30 to 35 years.” The company’s basic gutter machine is priced at between $6,000 and $6,500, while its highest-priced combination gutter machine costs between $15,000 and $16,000. Knudson has been in business for 40 years and, says Batz, “Our gutter machines have basically stayed the same. They tend to be gutter machines that people throw in the back of their truck and work very hard. Gutter companies want basic technology that’s going to be a solid workhorse, day in and day out. Toward that end Knudson has stayed, for example, with hardened stainless steel rollers rather than chrome plate, rubber, or neoprene. “We’ve tried adding things like computerized and hydraulic controls,” Batz reports, “but they don’t sell. In today’s gutter industry, if we put on features to our gutter machines that add $1,000 to the price, nobody will buy them. As long as the price of new gutter machines remains within reach, many installers will opt for the security and performance of new model. But that is accomplished, Batz believes, in part by providing basic and solidly dependable technology - and then offering quality support when any service is needed. Do the math, and it’s “fairly easy to find out how long it takes for a new gutter machine to pay for itself,” says Fred Gutowski, guttering sales specialist for Englert Inc. Though many large homes are being built today, he reports, residential gutters have historically averaged 120 feet of gutter per home. “If you use a subcontractor to cut-and-drop the material at your jobsite,” he continues, “your cost for gutter alone is somewhere around $1.50 per foot or higher. The cost of running your own gutters starts with understanding the “yield factor” of a gutter machine. Gutowski calculates that a gutter machine should yield 2.238 feet per pound of .032 aluminum gutter coil, and 2.653 feet per pound of .027 coil. Thus the cost-per-pound of gutter coil can be divided by the gutter machine’s yield factor to determine the contractor’s cost-per-foot of producing his gutters. If the coil costs $2 per pound, then a gutter machine would yield .032 gutters at 89 cents per foot and .027 gutters at 75 cents per foot. Either figure is a substantial savings over paying $1.50 per foot or more from a cut-and-drop subcontractor. By saving 61 cents a foot for .032 gutters, the $6,800 cost of an Englert 5" gutter machine would be made up after 11,148 feet - which divided by 120 feet per house would equal 93 jobs. “Since remodelers average 2.5 jobs per day,” concludes Gutowski, “you’ll pay for your gutter machine in about 37 working days.” Doing the same calculations for .027 gutters, and assuming a savings of 75 cents per foot, the cost of the gutter machine would be paid off after 76 jobs or approximately 30 working days. The same factors also can be used to calculate how much money a contractor would save in year. At 120 feet per job and 2.5 jobs per day, times five days a week and 52 weeks a year, the company would hang 78,000 feet of gutter. Saving 61 cents per foot on .032 gutters produces an annual savings $47,580; similarly, a 75 cents-per-foot savings on .027 gutters yields a yearly savings of $58,500 on the cost of materials. At New Tech Machinery of Denver, sales and marketing director Gary Battistella says the seamless gutter business has a history of innovation. “Seamless gutter machine, when they came out in the late 1950s and early 60s,” he says, “were a big technological advance over the days of having to solder sections together. In the 40 years since the original seamless gutter machine was established in the marketplace, three new generations of gutter machines have been spun off and come to market. New Tech was the first to go beyond the original metal-tometal drive systems and instead use an independent polyurethane drive and free-floating forming rollers. Yet being a technological leader has come with a price. “Some competitors have copied us,” Battistella says, “and so we’ve had to do some research on how to boost our profits." "The assessment began with the recognition that “the market for 5" k style gutters has gotten to where customers are only interested in price, and there’s a limit to what they’re willing to pay,” he says. More than a decade ago, when competitors were selling gutter machines with the original metal-to-metal drive systems for $6,200, New Tech was compelled to lower its $7,500 price for a 5" gutter machine to $7,125. “We believed that we had the better product, because our independent polyurethane drive lets you run different thicknesses of metal without having to adjust the gutter machine,” Battistella recalls. “But if our gutter machines were priced above the competition, what could we do? In order to better compete on price, the company expanded to Mexico in September 2004. New Tech’s Hermosillo plant is being operated in the same manner as the Denver plant, and every Mach II gutter machine produced in Mexico is delivered to Denver for rigorous testing and quality checks. New Tech has passed the savings along to its customers, and the result is a technologically advanced 5" gutter machine that sells for $5,875. 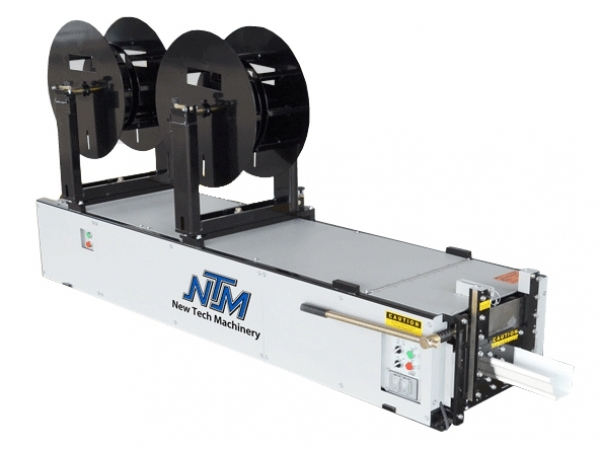 New Tech has similarly been able to lower the price of its 6" gutter machine from $9,750 to $8,500, and a combination machine priced at $11,500 instead of $13,950. Gutter companies have responded, he says, as New Tech production of 5" gutter machines has doubled since January. New Tech, which also makes metal roof and wall panel machines, has benefited from roofers’ desire to control a project from start to finish. “More roofers are starting to buy gutter machines so they can control their job finish, since they don’t get paid until the gutters are installed and the job is finished. Battistella believes combination gutter machines that can run both 5" and 6" gutters are an option more installers should consider. “Our gutter machine is designed so you can convert from one size to another in 15 minutes,” he says. “Especially if you’re a large company and send out several trucks, a combination gutter machine lets you use one vehicle for both 5" and 6" gutter jobs, rather than having to send two different trucks into the same territory. Even start-up companies, he suggests, should look into buying a combination gutter machine. “If you’re a new company and in an area where both 5" and 6" gutters are sold, a combination gutter machine will let you take more jobs and not have to use a subcontractor. The choice of a gutter machine also depends on the operator, says Kenneth Minor, executive vice president of KWM, a manufacturer based in Rockdale, Ill. “In buying a gutter machine,” he counsels, “ask yourself what kind of material you’re going to be running through the gutter machine. Installers who run copper or steel in addition to aluminum, he points out,“might want to consider a gutter machine that has passive rollers with a urethane drive train. You’ll pay about 7 to 10 percent more for the gutter machine, but you’ll be able to roll different materials without having to adjust the gutter machine. Minor agrees that the U.S. market is served by perhaps a half-dozen major gutter machine manufacturers.“But you also need to look at the distributor you’ll be working with,” he advises. “Can your distributor give you service, so you don’t have to send your gutter machine back to the factory? Also is your distributor factory trained by the manufacturer? Like other manufacturers, Minor pegs the average industry price of a 5" gutter machine at $6,000 to $7,000; a 6" gutter machine at $8,000 to $9,000; and a combination gutter machine at $12,000 to $13,000.“It depends on the options you select,” he says. On the other hand, a gutter machine also has an inherent advantage that adds to their service life. “The gutter machines are slow moving, only about 25 to 30 feet per minute,” Minor explains, “and so they should last a long time. If you have to replace a gutter machine in five or seven years, it’s because of operator abuse. Minor’s own opinion of combination gutter machines is they tend to work best for smaller operators. “If you’ve only got two or three employees who are changing the gutter machine over from one size to the next,” he contends, “then they know the gutter machine and know what they’re doing. But if you have 8 to 10 employees who will be using a combination gutter machine, that’s too many people. The adjustment and settings will get messed up with that many people all making changes to the gutter machine. The gutter market is evolving and KWM strives to stay ahead. The company plans to introduce a half-round gutter machine in the near future, says Minor, to serve the increasing demand for half-round products. On the other hand, KWM does not make gutter machines capable of producing gutters with protective covers. “We just don’t think one-piece gutters with gutter protection really work,” states Minor. According to Minor, KWM is committed to researching continued improvements in gutter machine technology. “In the future I think we’ll see improved guillotines, and features that improve inventory control and overall userfriendliness. ”Yet in the end, he believes, “The basic technology will stay the same. There are tons of things we could do in adding new features to gutter machines, from digital controls on down. But the marketplace dictates that, if you raise the cost of a gutter machine too much, nobody will buy them. After these contractors experience repeated instances of waiting for gutter sections to be delivered to their jobsite, Butowski says, “They’re ready to buy a gutter machine and produce their own gutters in the field.” Companies can make their own gutters at a lower cost-per-foot than by purchasing materials from a cut-and drop subcontractor. So he says that the $6,800 price of an Anglert 5" gutter machine can be paid off in less than 40 days and yield annual savings of around $50,000 in material costs. Intense competition among gutter machine manufacturers means that prices vary by only a few hundred dollars across the industry, Butowski observes. For example, in addition to the $6,800 gutter machine for 5" gutters, the company offers a 6" gutter machine at about $8,000 and a 5" and 6" combination gutter machine at about $12,000. A 7" gutter machine to run gutters for commercial jobs will be introduced in the near future. Since gutter machine prices do not vary widely, Butowski adds, “You can get a new gutter machine for only a few thousand dollars more than a used gutter machine. A used gutter machine generally cost about $3,000 to $3,500. So you might save a little bit up front. But is it worth it, when you have to sacrifice the better technology and the warranty that comes with a new gutter machine?” One viable option, he says, is to buy a reconditioned gutter machine from Anglert or another manufacturer. Seamless Gutter Machines: Which Type Is Best for You?